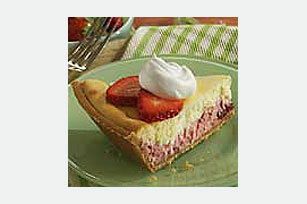 Three steps and just 10 minutes of prep time yield one creamy, layered cheesecake made with strawberry preserves and garnished with sliced berries. Preheat oven to 350°F. Beat cream cheese, sugar and vanilla with electric mixer on medium speed until well blended. Add eggs; mix just until blended. Remove 1 cup of the batter. Add preserves and food coloring; stir until well blended. Pour into crust; cover with the remaining plain batter. Refrigerate 3 hours or overnight. Top with the whipped topping and strawberries just before serving. Store leftover cheesecake in refrigerator.